Although I almost never eat them plain, peaches are one of my favorite fruits. First I absolutely love the color of a peach with its skin removed. The pale orange gradually darkening into a deep mauve-ish color. Then there is the smell of peaches. It just screams ‘SUMMER!’ I could easily have my house smell like peaches year-round and be completely content. It seemed like all through the winter when I would flip through my recipe binder for a muffin to make, I would always end up staring at this recipe and wishing peaches were in season. 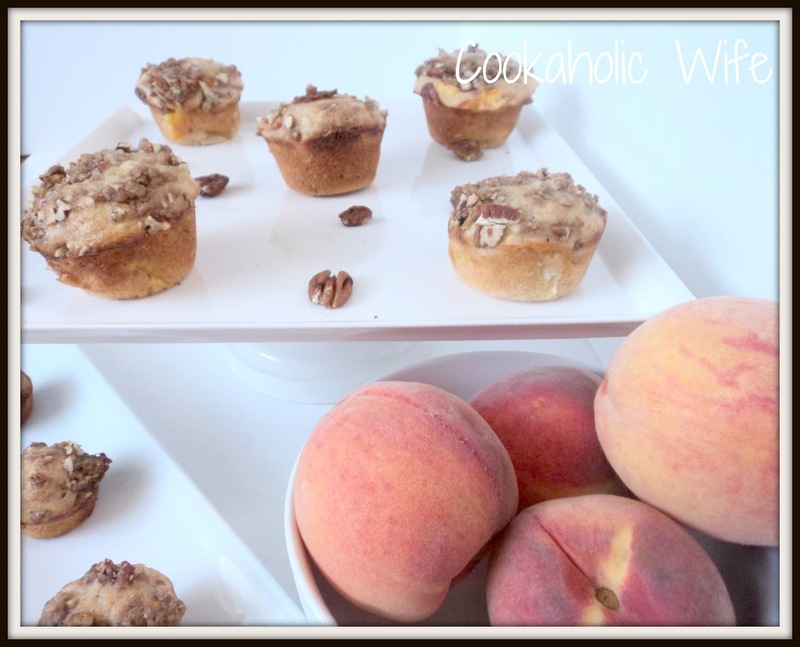 At the end of July I started thinking about these muffins, patiently watching the calendar until I thought it would be the perfect time to buy the peaches and make this recipe. I didn’t want the pieces of the peaches to get lost in the muffin so I chopped my peaches fairly large. 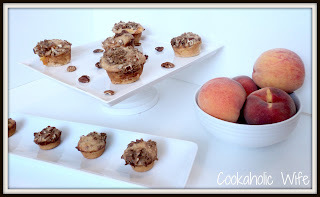 I think it definitely paid off as almost each bite of the muffins were bursting with peach flavors. 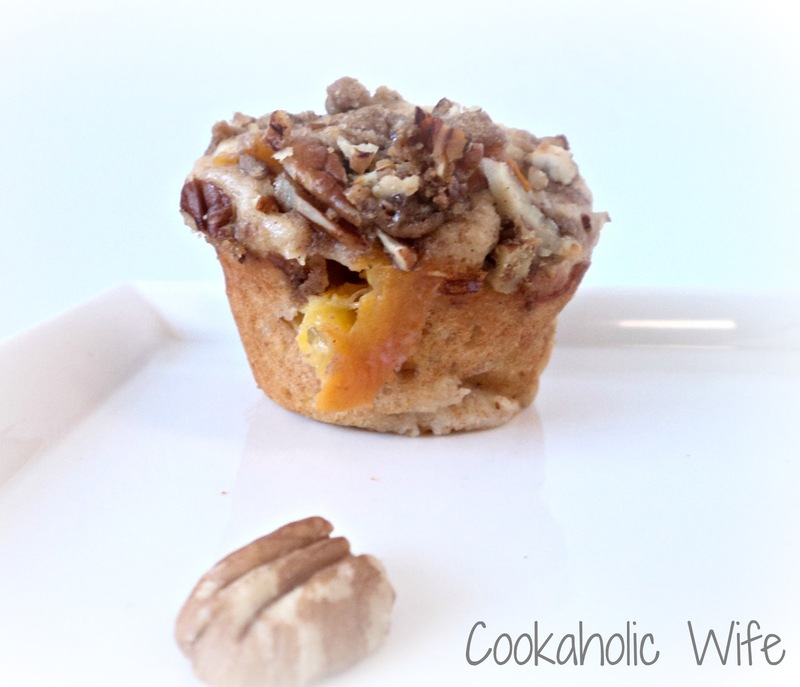 The pecans added a great crunch to the muffins and overall the just reminded me of summertime in the south. I ended up taking the mini muffins into work which my coworkers gobbled up instantly while moaning in delight. 1. Preheat the oven to 375. Spray a large muffin tin and a mini muffin tin with non-stick cooking spray or line with paper or foil liners. 2. In a bowl, whisk together the yogurt, eggs and milk until combined. Set to the side. 3. In a large bowl, combine the all-purpose flour, wheat flour, sugar, baking powder, cinnamon, baking soda and salt together. Fold the yogurt mixture into the dry mixture until combined. Gently stir in the peaches. 4. Prepare the streusel by combining the flour and brown sugar together into a small bowl. Using a fork or your fingers, cut in the butter until the mixture resembles coarse crumbs. Mix in the pecans. 5. Scoop the muffin batter into the tins, filling the large ones 3/4 of the way full and the mini ones all of the way. Sprinkle the streusel topping over the muffins and place both tins in the oven. 6. Bake the mini muffins for 20 minutes and the large muffins for 25-30 or until a toothpick inserted in the center of the muffin comes out clean. 7. Let the muffins cool for 5 minutes before transferring to a wire rack to continue cooling. Store in an airtight container for up to 4 days. Never even thought of peaches in a muffin, and I especially like the mini ones because they're so easy to eat without making a mess. Thanks for the recipe. Your peach muffins look fantastic and very delicious! One of these would be perfect right about now, made with fresh Ontario peaches…. Yum!